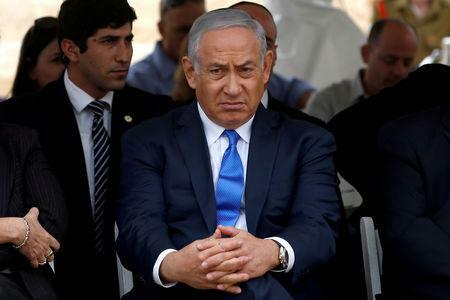 JERUSALEM (Reuters) - Israeli Prime Minister Benjamin Netanyahu faced calls on Thursday from his coalition partners to hold an early election, a day after the defense minister's resignation left the government with a razor-thin majority. Avigdor Lieberman quit on Wednesday over what he described as the government's too-soft policy on cross-border violence with Palestinian militants in the Gaza Strip. The loss of the five seats of Lieberman's Israel Beitenu faction leaves Netanyahu with control of just 61 of the 120 seats in parliament, raising the prospect that a scheduled November 2019 election would be brought forward. Lieberman's resignation takes effect 48 hours after being handed in, which he did early on Thursday. Each coalition partner will then have the power to bring down the government. Israel's Finance Minister Moshe Kahlon, who heads the centrist Kulanu party, said he told Netanyahu in their meeting that the responsible step to take would be to establish a new and stable government. "The best thing for Israel's citizens and economy is to hold an election as soon as possible," Kahlon said in a statement. His call was echoed by Interior Minister Aryeh Deri who heads the ultra-Orthodox Shas faction. Adding to the pressure, Israel's Education Minister Naftali Bennett, who heads the far-right Jewish Home party, has demanded the defense brief by given to him. Both Lieberman and Bennett, who compete with Netanyahu's Likud for right-wing voters, have spoken in favor of harsh Israeli military action against Gaza's dominant Hamas Islamists. "I asked the prime minister yesterday to appoint me defense minister to fulfill one goal only - that Israel start winning again," Bennett said at a conference near Tel Aviv. Netanyahu is under investigation for corruption, and speculation has been rife that he may bring the ballot forward in order to win a renewed mandate before Israel's attorney-general decides whether to indict him. A poll published on Wednesday by Israel's Hadashot television news showed Likud falling by one seat from 30 to 29 after months of surveys that have shown it gaining power. Only 17 percent of respondents were happy with Netanyahu's Gaza policy.